Share a few of the best of Texas with our "All Things Texas Gift Basket". This Texas Flag filled tub has our best Tortilla Chips, Salsa, Chocolates plus many Texas souvenirs to keep and enjoy long after the food is gone! 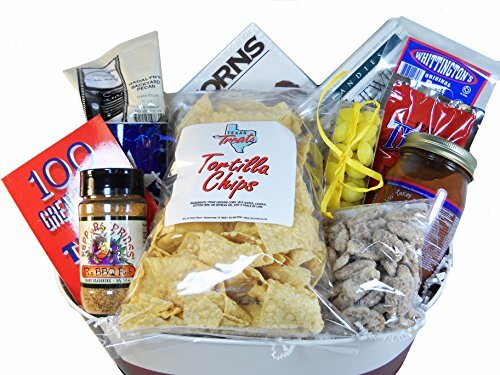 Metal Texas Flag Tub (15" x 10) JR's BBQ Meat Seasoning (5.5 oz) Tortilla Chips (6 oz) Tres Clilies Salsa (16 oz) Praline coated pecan halves (6 oz) Texas sized Texas Flag Mug with pack of Pecan Coffee Lammes Chewy Pralines (6 oz) Lammes Longhorns (6 oz) Whittington's Beef Jerky bites (2 oz) 100 Great Things About Texas Trivia Book Yellow Rose of Texas Lemon Drops (4 oz) Bear Creek Chili Mix Topped with a Texas themed bow You are going to love giving this gift basket and the recipient will love receiving it! Great for birthdays, new house warming gifts, Mother's Day and Fathers Day gifts, anniversary gifts and misplaced Texan's! If you have any questions about this product by Texas Treats and Gifts, contact us by completing and submitting the form below. If you are looking for a specif part number, please include it with your message.